I'm constantly riding the line between cheap and thrifty. I'm also constantly sitting on the fence between splurging and wasting money. 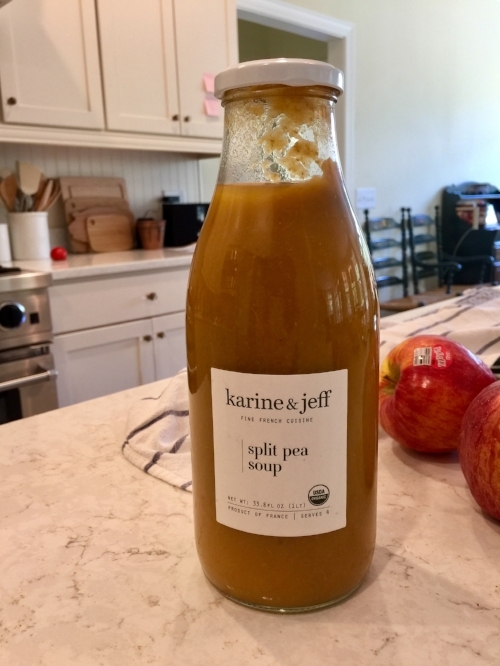 I like to sit right at the edge of most things in life, which is where I found myself a few days ago, heading toward town with a glass-bottled jar of split-pea soup and a crumpled receipt. The day before, I'd decided to do my grocery shopping at a fancy grocery store, purchasing less food but making it all really lovely. The entire experience was great. The store is pretty, small and full of wine, fancy cheese and sparkling produce. Down one of the aisles, I saw this jar of soup. I was immediately drawn in. I loved the simple label, the glass jar and the fact that it was rustic French, which made me think that if I ate it, I'd be a slim, chic and mysterious like a French woman is supposed to be. I bought the soup for a whopping $10 (that's actually a lot here in the U.S.) and sauntered to check-out already feeling a little more sophisticated. At home, I heated the shop and made this beautiful lunch of arugula and spinach salad (with home-grown tomatoes) and soup. I sat down, an actual cloth napkin in my lap and took a bite. Hmmmm. It was....plain. A little burnt? Was it burnt? Surely not. Perhaps it just needed salt? I'm not a huge fan on salting food after the cooking process is complete, but I relented and added salt. I ate about six bites before finally giving up. It's awful. AW-FUL. It is tasteless except in the way it tastes burnt, as if it was a pot of unseasoned peas and vegetables, left to simmer too long and then shoved into a jar and sent off the America where apparently we'll pay $10 to eat just about anything. I know. That was taking it a little too far. The soup is truly awful, however. I immediately determined to return it, get my $10 back and buy a wedge of brie. As I headed off, my daughter laughed at me, a little horrified that I'd be taking food back to the grocery store. I was all defensive and lecturing her about wise spending habits, the worth of $10 and letting stores know when they sell inedible food. I left her still laughing and began driving toward the store, the receipt, having been dug out of the trash, beside me. I got about 5 minutes down the road before turning back. I thought about the soup as I drove and realized that I'm fine taking food back if it's bad, spoiled or rotten or of lower-quality than advertised. Even then, I sometimes just toss it. If an avocado is bad, I toss it. If peaches are mushy instead of juicy, I toss them. If a wine isn't to my liking, I let my husband drink it. But this soup wasn't bad or rotten or spoiled. I just didn't like it, much the same way I wouldn't care for a bottle of wine. I'd never dream of returning the wine simply because I didn't like it, so why did I think I should do that for this soup? The soup was perfectly fine, and some people may even enjoy it. That I didn't care for it wasn't the fault of the store. I got home, poured the soup down the disposal and recycled the bottle. But it still nags at me a little: would you have returned the soup? Is returning food to the store 'trashy' and 'low-class' or thrifty and wise? I know everyone has to define money well-spent for him or herself, but I really do sometimes wonder what is appropriate or when I've gone too far into thrifty territory and am now squarely in miser-land. Otherwise, the sun has been out for a few days, so my spirits are bright. We've had massive thunderstorms at night, the power going out and my husband constantly reminding me how smart it was on his part to include a generator in our house budget. I must concede this point. It's been nice. I'm off to quit slackin' and make s*#t happen today. Wish me luck.